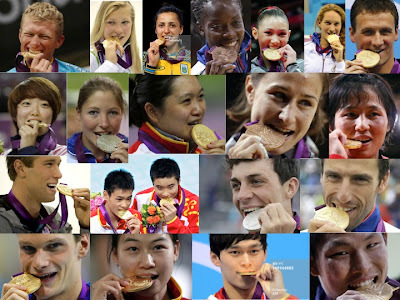 If you've seen much of the London 2012 Olympics so far, especially online or print coverage, you'll almost certainly have seen a pic of a medal winner biting his or her piece of bling. It took me just a few minutes to find the images above; no doubt many thousands of pics like these have been taken already, just a few days into competition. The origins of the tradition of biting the medal are well known: gold is a soft metal, and biting on a coin (or medal) could establish its authenticity or purity. No doubt the first athlete to do it was making a spontaneous and genuine gesture of amused disbelief ("Wow! Have I really won gold?!"). A few more athletes imitate the first, and it remains something the athletes own. But then the press pack get a hold of it, and the spontaneity and meaning are lost. Aesthetically, it now almost always looks ugly and ridiculous; many of the medallists look uncomfortable or at best bemused. They are clearly being coaxed by photographers to do it. But when even silver and bronze medallists are being bullied into making what is now a meaningless gesture, it has clearly lost its meaning and become just another stupid journalistic cliche.